Just an “isolated incident”, nothing to worry about. Happens every day, or something…. An update on this story. The hijabbed Ayaan Ali screamed “Kill! Kill! Kill!” as she stabbed one man and tried to stab others. But the intrepid British police assure us that it was not an act of terrorism. Well, then, what was it? Was it an act of jihad? 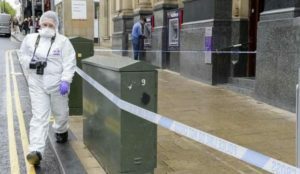 Do the British authorities consider jihad violence to be terrorism? Do they believe there is even such a thing as jihad violence? Why was this woman screaming bloody murder, quite literally, and running amok in Barnsley? Was it “mental illness”? Why are British police being so unforthcoming about this case? Could it be that they have something to hide, some interest other than protecting the British people? “Woman charged with attempted murder over Barnsley stabbing, as police rule out any connection to terrorism,” by Sarah Marshall, The Star, September 9, 2018, via Jihad Watch. Police charged Ayaan Ali, of Isleworth, Middlesex, has been charged with attempted murder, affray and possession of an offensive weapon and remanded in custody earlier today…. “I trust that this offers some reassurance and closure to the Barnsley public after what must have been a very shocking day yesterday…. Was the crime committed by an islam muhammad the criminal emulator … if yes !! Then it was an act of terrorism !!! Remove and Permanently “incarcerate“ these criminals and reverse the invader islam immigration and residency) !! !